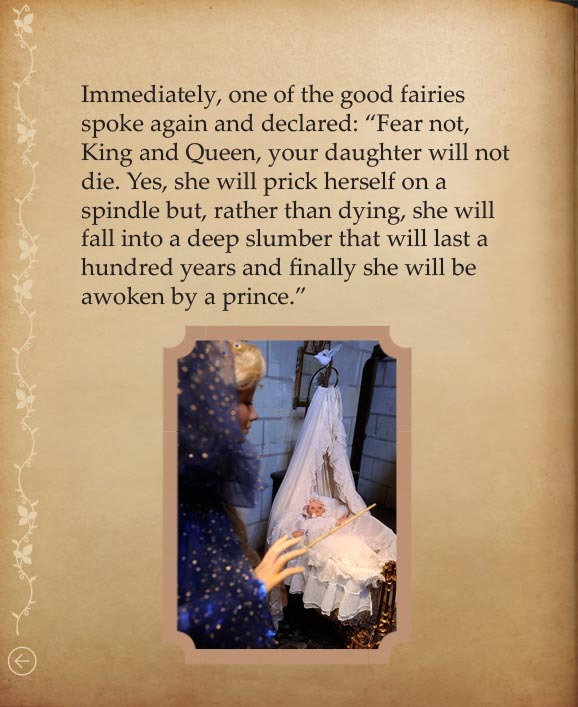 a princess fell asleep for a 100 years…. Let the magic of the place take you to a fairy tale world. Once upon a time the King and Queen were finally blessed with a daughter. They were so delighted by the arrival of their beloved princess that they made all the fairies in the kingdom godmothers. On the day of the christening each of them bestowed a gift on Aurora: beauty, grace, talent, and all things that would render her happy. 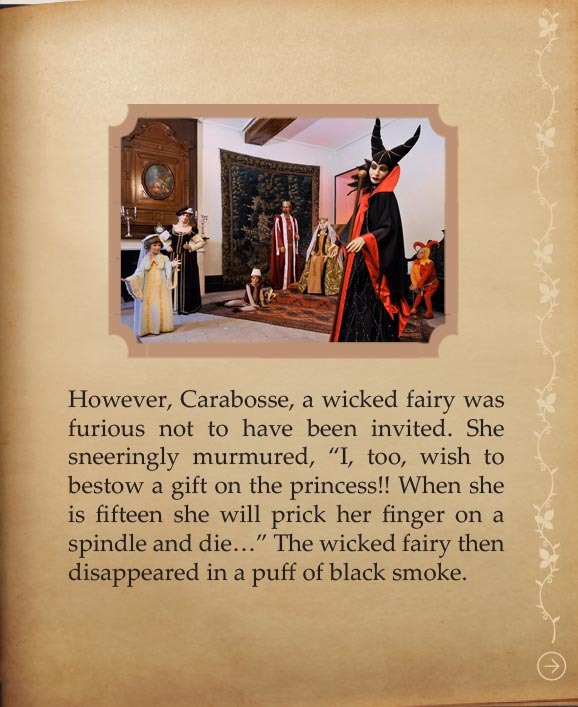 However, Carabosse, a wicked fairy was furious not to have been invited. She sneeringly murmured, “I, too, wish to bestow a gift on the princess!! When she is fifteen she will prick her finger on a spindle and die…” The wicked fairy then disappeared in a puff of black smoke. 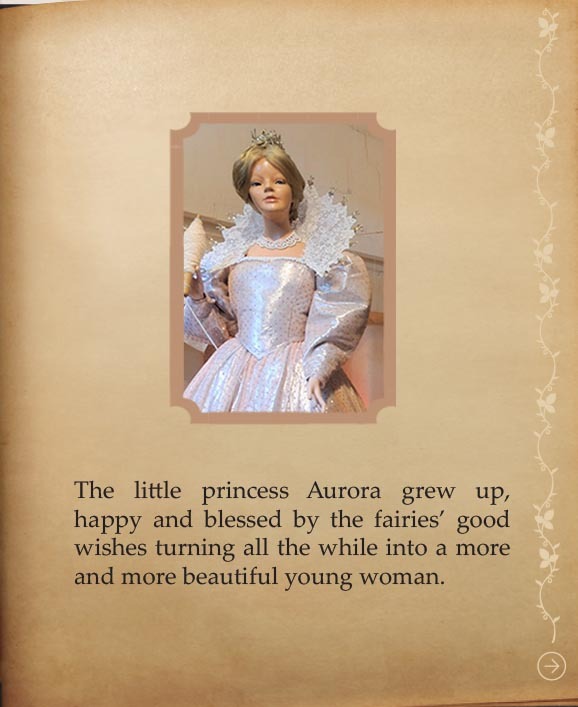 The little princess Aurora grew up, happy and blessed by the fairies’ good wishes turning all the while into a more and more beautiful young woman. On the day of her 15th birthday she was strolling around the castle and at the top of the tower she came across an old woman who was spinning wool on a spindle. Aurora wanted to try turning it but alas, she pricked her finger and fell to the ground in a dead faint. The King and the Queen were overcome with grief and had her carried onto a majestic bed in the most beautiful room in the castle. 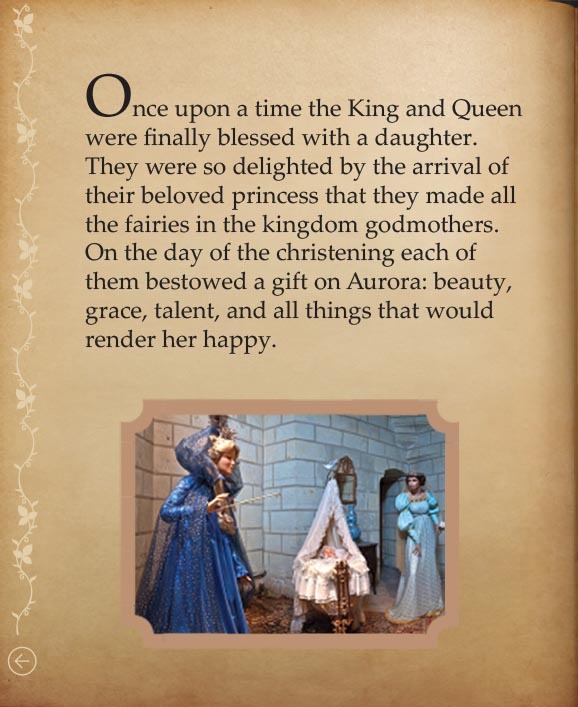 On learning the terrible news, one of the good fairies waved her magic wand over all the living creatures in the vicinity, apart from the King and Queen, as she didn’t want Aurora to wake up alone. 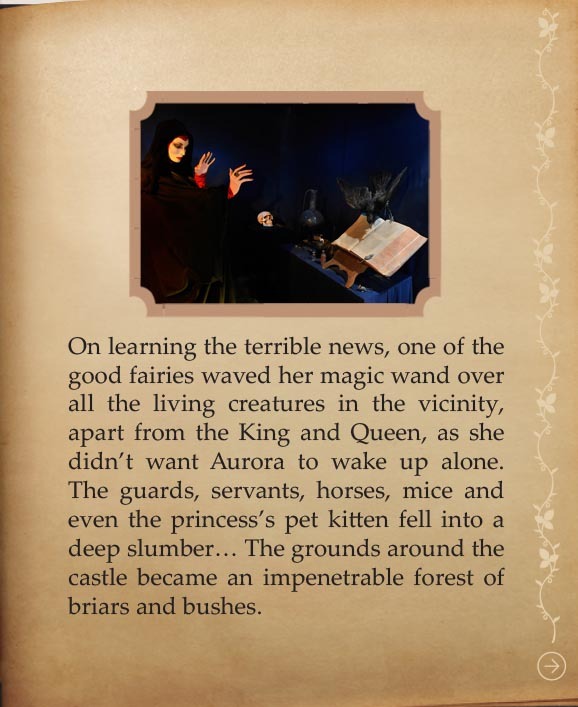 The guards, servants, horses, mice and even the princess’s pet kitten fell into a deep slumber… The grounds around the castle became an impenetrable forest of briars and bushes. Time passed…until one day a prince from a neighbouring kingdom was curious to know about the mysterious castle lost in the undergrowth. 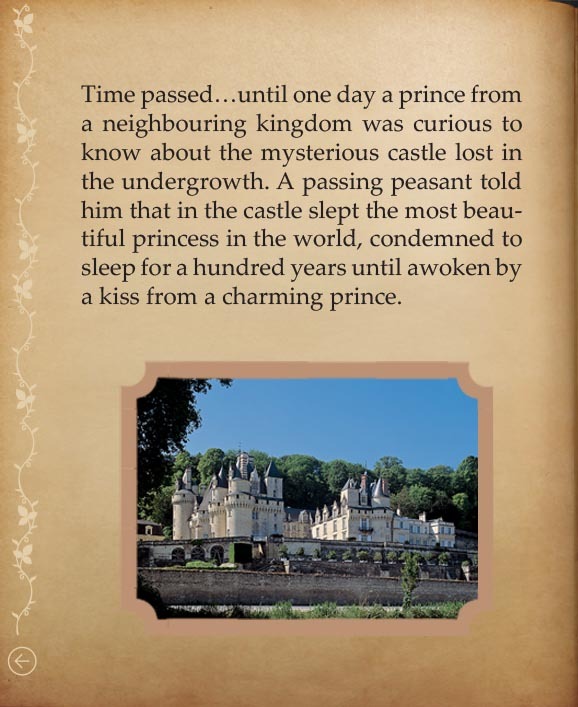 A passing peasant told him that in the castle slept the most beautiful princess in the world, condemned to sleep for a hundred years until awoken by a kiss from a charming prince. Spurred on by love and the desire to see this incredibly beautiful young woman, the prince made his way towards the castle. As if by magic, trees and briars opened a pathway in front of him as he wound his way forwards. In the courtyard he found all the inhabitants sound asleep, then trembling with emotion he made his way to the princess’s chamber. Astounded by the young woman’s beauty he knelt gently beside her and softly kissed her. As if by magic the princess opened her eyes and the whole castle came back to life as if nothing had happened! 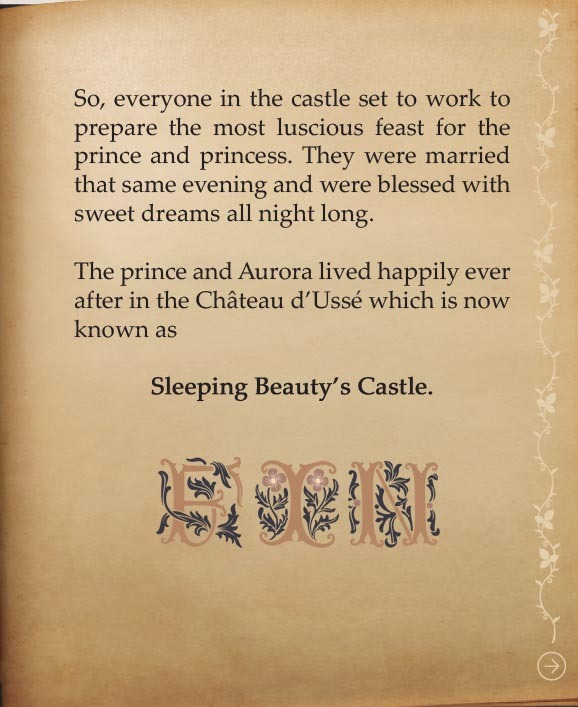 So, everyone in the castle set to work to prepare the most luscious feast for the prince and princess. They were married that same evening and were blessed with sweet dreams all night long.